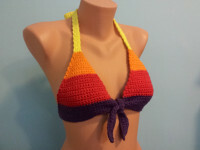 This purple, red, orange, & yellow bikini top is crocheted with 100% cotton. It ties behind the neck & back. Fits an A/B cup.